The strangest of all HP Lovecraft weird tales isn’t fiction at all but concerns his marriage to businesswoman Sonia Greene. The horrors which make Lovecraft’s fiction so chillingly effective may not have been merely a product of his imagination. (p. 139). 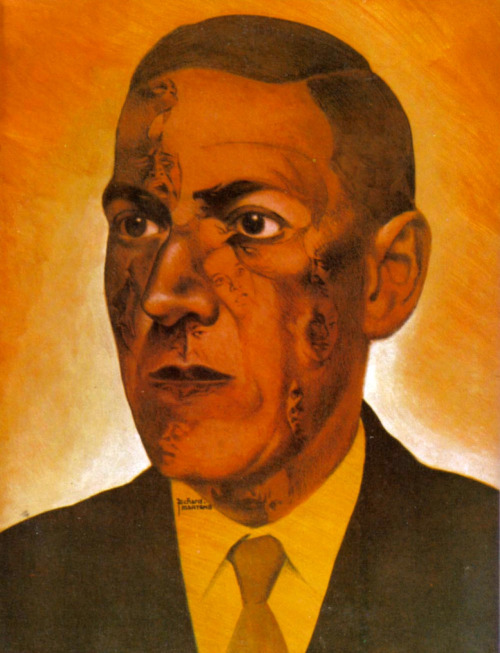 Weird Tales was the name of the magazine that published Lovecraft’s horror stories. Lovecraft is famous as the creator of the ‘Cthulhu mythos’, about a pantheon of evil alien gods – the Great Old Ones – that seeped down to Earth from the stars. They have been banished, but nevertheless still wait for their chance to return, when the stars are right and Great Cthulhu himself rises from the deep in the submerged city of R’lyeh. Either to destroy humanity, or bring about an unhallowed age of reveling and killing. It’s hard to see how the cosmic horrors he described had any basis in reality. But Lovecraft himself was racist. He was anti-Semitic, despised Blacks and the non-White immigrants then entering New York and America. Recurring themes in his stories are racial decline, inbreeding and miscegenation. Not just with evil, non-human races, as in his short story The Shadow over Innsmouth, but also with other, human peoples. Cthulhu is worshipped by mixed race ‘mongrels’ like the rural people of Louisiana and the docks districts of the ports. He also had contempt for the rural ‘White trash’ of the southern US as well. It’s questionable just how racist Lovecraft was. He was racist, but at the time so were many other Whites, and it’s actually debatable whether he was worse than most other people. I don’t know much about his personal life, except that he spent most of it in his home town of Providence, Rhode Island. I also think that his wife was Jewish. She said that she did her best for him, so that he would become a chrysalis out of which would emerge a great writer. She lamented that the great writer did indeed come forth, but that he became ever more distant from her. See the biography, The Strength to Dream. I suspect the drama’s about his deteriorating relationship with his wife, as he moved away from her to produce his tales of cosmic horror.